A cheap new device that can be attached to a smartphone can reportedly diagnose cases of sexually transmitted diseases such as HIV and syphilis – and, amazingly enough, the test only takes 15 minutes to complete. Developed by researchers at Columbia University, the new phone attachment is being heralded as a potentially transformative breakthrough, due in no small part to its low cost. While the typical diagnostic machinery used to detect HIV and syphilis costs more than $18,000, the new mobile “dongle” costs a mere $34 to manufacture. According to a new study published in the Science Translational Medicine journal, the smartphone dongle was tested on 96 patients from Rwanda. The device had a 92-100 percent sensitivity rating when it came to correctly identifying infected patients, but its specificity rating was notably lower at 79-100 percent. That means that some individuals were incorrectly identified as infected even though they were not. While researchers work on improving the accuracy, there are still high hopes for the machine, as the data compared favorably to the results of the costly enzyme-linked immunosorbent assay (ELISA) test. Even a device with 70-80 percent specificity and sensitivity could reduce syphilis-related deaths significantly, for example. Detecting HIV early in pregnant women, meanwhile, could help reduce the risk of passing the disease on to children. 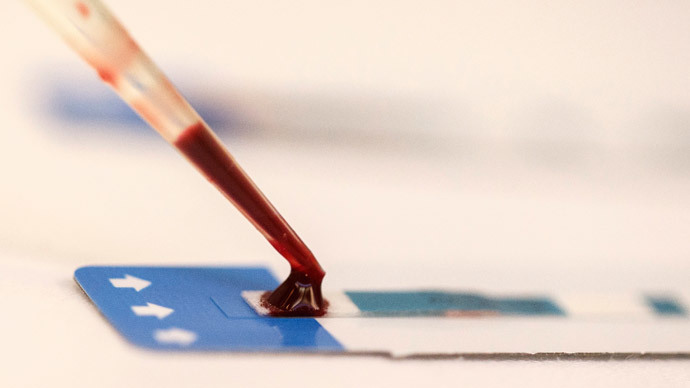 The dongle works by collecting a pinprick of blood from a patient’s finger and uses a built-in ELISA test to detect whether the number of HIV- and syphilis-fighting antibodies in the blood are higher than average. Notably, the dongle does not have to deplete its own set of stored energy. By connecting to a smartphone’s audio jack, it can instead use the device’s energy to power its analysis. With one test underway, the researchers are working on a much bigger test trial. If successful, they hope to attract the attention of the World Health Organization and use the device in affected countries.